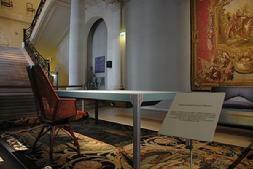 It would be difficult to overstate Pierre Paulin’s influence on 20th Century design. It would be a further challenge to fully convey the elegance and importance of Paulin’s work for Baker. While the collection presented challenges to Baker craftsmen, and was priced accordingly, we’re including additional pictures below in an attempt to illustrate Paulin’s work. Further below are selected auction results. The Baker offering derived in many ways from Paulin’s 1984 work for Francois Mitterand’s Elysee Palace presidential offices. 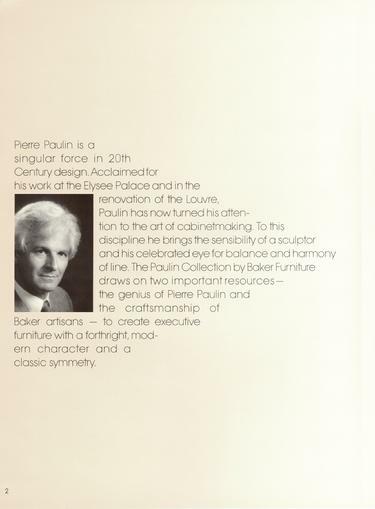 Below is found additional information about Paulin, his incredible design career, and "The Paulin Collection" for Baker. Please scroll down. (above) Paulin biography from the Baker "Paulin Collection" catalog. Note the delta shape of the text block, from left to right; this shape is used as inlay on the top surfaces of several of the Baker case pieces and on the back splats of the visitor chairs. 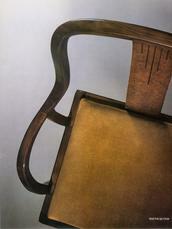 See this motif also on the #1032 Chair below. 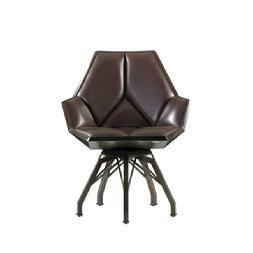 Paulin's Pierre Paulin's broad work for Artifort and Ligne-Roset is well known, and often appears in the secondary market, with continually escalating results. 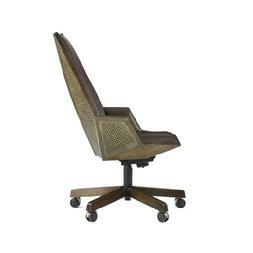 Examples include the "Tongue" chair, the "Ribbon" chair, and the "Elysee" sofa. 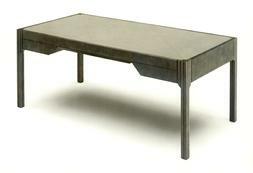 Examples of the Baker offering by Pierre Paulin are fairly rare. 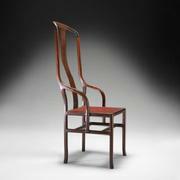 In Chicago at the Wright 20 auction house, the above chairs were offered in the December, 2010 sale. Both of these examples sold successfully, with prices achieved as noted. In both our research and personal recollection, these are the only two items from the Baker "Paulin Collection" we note being offered at auction in the last 20 years or so. We are grateful to Wright for these photographs. 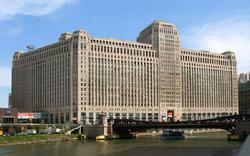 click on Merchandise Mart image for further information about Baker Furniture Executive Office introductions and the annual Chicago NEOCON introductions.